What’s biting at what time of year? January This month varies depending on water temperature as to where we will be fishing. Colder water temperatures, say less than 63 degrees, we will be targeting Redfish, Black Drum, Trout and Sheepshead in deep water in close proximity to the flats. When the water temp is warmer than 63 degrees, I generally will be catching fresh white bait and fishing for Snook on the flats with Redfish and Trout mixed in. The reef fishing is also good this month for Grouper, Snapper, and Hogfish. The beaches will sometimes have good numbers of Tunny and Bluefish eating on glass minnows, great for fly fisherman especially. Also there are times when we find lots of baby Permit and large Pompano on the beaches and at the edge of the flats. February This month can be very similar to January in the beginning of the month. When the water is colder we are fishing in deeper 6 to 9 ft. of water. Again when it warms up to 63 degrees and above, we are targeting the shallow water Snook with live bait. As we progress into the month the cold fronts become less frequent and strong. As well as more sun light hitting the water for a longer period of time, we get more into shallow water Snook, Redfish and Trout patterns. It can be some of the best shallow water sight fishing for Snook on live bait or fly tackle alike. As for offshore it is about the same as January. March What a great month for shallow water sight fishing for Snook and Redfish! We also get trout mixed in if we slide out a little deeper; we can catch lots of trout. Though the Snook and Redfish are so good, there is little reason to waste time with Trout unless you are looking for more fish to fill the box. This is a great time if you enjoy watching the fish come up and explode on you live minnow or fly. My fly fishermen especially like this time of year because you will actually see 90 per cent of the fish take the fly. The offshore fishing includes Grouper and Snapper ready to bite. As the offshore water temperatures make it into the 70 degree range, the Kingfish and Little Tunny can be caught in large numbers usually toward the end of the month. Many of these early season Kingfish and Little Tunny seem to be larger ones as well, many times topping 30 and 40 pounds. Believe it or not Tarpon can be quite good this month as well. They are all Tampa Bay resident fish most are found around bridges this month. It is possible to have a 10 Tarpon day hook up on these fish that range from 50 to 200 pounds. April What an awesome time to be on the water! The weather is warm even when you start the day. Inshore fishing rivals the offshore fishing. Both are very good, and it is hard to decide which way to head inshore or off. The shallow water fishing for Snook, Redfish and Trout is excellent. Offshore fishing is peeking with Kingfish, Tunny, Mackerel, Grouper, Snapper, Goliath Grouper, Sharks, Permit and sometimes even a Sailfish possible. Many times you can sit in one spot all day with a good chum slick going and catch a smorgasbord of different species often so fast it is hard to keep bait the water. Tarpon fishing is available for resident Tarpon at this time as well. May This is my favorite time of year, the start of the Tarpon migration. This is when large pods of Tarpon are found near the beach during their migration (from the ???). Sometimes these schools can be 500 fish deep. All large fish averaging 75 to 130 pounds; trophies are 150 to 200 pounds. At this time and over the next three month Tarpon fishing in the Bay area is what I consider the best sight fishing in the world. For that matter some of the best fishing in the world period. An average day in my boat is 6 to 12 hook ups, and some days we will hook over 20. Whether you prefer conventional tackle or fly tackle or whether you like to fish or not, this is a one of those life experiences everyone should enjoy at least once. It is truly an exciting adventure. May is peak Tarpon fishing time, and that is what I spend most of my time doing. Inshore fishing is also very good; there are a lot of nice size Snook and Redfish to catch out there and plenty of Trout. The Kingfish are still around at the beginning of the month but thinning as the water warms. 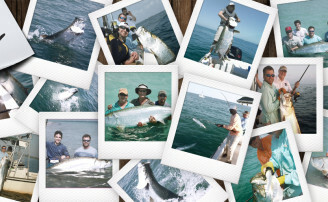 Lots of Spanish Mackerel, Tunny, Grouper, Snapper, Sharks, Goliath Grouper, sometimes some Permit, which can run up to 40 pounds as well, are available for an angler to enhance their day of fishing. June Now we are right in the middle of the peak Tarpon season; Tarpon can be found everywhere. They are on the beaches, in the passes and all scattered throughout Tampa Bay. Pressure is higher, but there are more Tarpon scattered in more areas. I still have no problem finding nice large schools of Tarpon all to myself. As far as Tarpon goes it is pretty much the same as May as far as the number of fish we hook per day and the style of fishing just a few more fish scattered in more places. Just like May I spend the majority of my time Tarpon fishing, but there are a lot of other good targets at this time as well. The Snook are spawning, and it’s a good time to catch a trophy Snook as well as the advantage of a lot of numbers. Redfishing is strong. The Trout are literally everywhere. Offshore and in the deep areas of the bay, Spanish Mackerel, Tunny, Cobia, Jacks and Palagics (spell??) are plentiful. On the bottom lots of Snapper are available, and in close Grouper are moving farther out but biting well. Want something bigger than a Tarpon; Goliath Grouper are still okay and of course lots of Sharks including Hammerheads, Bulls, Blacktips and many more. Some of the Hammerheads can be as large as 15 plus ft. and 1500 pounds. June is also a good month for Permit; they are in passes on the beaches. I see them while Tarpon fishing and offshore on the reefs. July Tarpon runs May through July. The migration usually ends around the third week of July and sometimes until the end of the month. After that we are back to fishing resident Tarpon. July is a great Tarpon month rivaling May and June, and what I spend 95 percent of my time doing. Snook and Redfish are still strong and starting to mix back together more, and Trout are thick. Tunny fishing is still good, and some Cobias are around offshore. Snapper fishing is really good in the back and close offshore. Grouper are further out with lots of Dorado out there in the same depths as the Grouper. Sharks are thick; hot water equals more hungry sharks. July is a great month for Permit thick in the passes and offshore. August Well tarpon migration is over, and I need a break from rocking around in my Tarpon tower at this point anyway. Just because the migrating Tarpon have left doesn’t mean I am through with Tarpon though. We still have some great days on the resident Tarpon at this time, and they are just as big and fight just as hard. The Red fishing is really coming on strong this month. It’s one of the best months for big Bull Redfish. A lot of times we will be on schools of 28 to 35 inch fish sometimes larger occasionally up to 40 inches. On a good day you can catch them till your arms fall off. There are still plenty of Snook available. Sometimes mixed in with the Reds, which is nice. Lots of Trout are available. Offshore lots of Snapper are everywhere. Tunny are still thick, and I like to plan Redfish and Tunny combo trips this time of year. My fly fishermen really love it. Grouper are way out (where????). Permit are can still be found on the offshore reefs. Like I said before hot water equals plenty of Sharks, lots of black tips. September I Like September a lot especially on the flats because of good fishing and light boat traffic. September is a great Redfish month much like August where we target the big Bull Redfish. 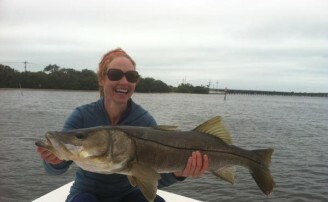 Snook fishing is more consistent than August and comes into season September first. Trout fishing is also good. As for offshore fishing Spanish Mackerel are starting to move back into the area. There are lots of Little Tunny and Snapper around the Bay. Grouper are further offshore. Permits are sometimes available on offshore reefs. If you are interested in Tarpon, they are still available in a few spots in the Bay sometimes; late in the month there will be a few off the beach. Sharks are around and easy to catch in large numbers as well. October One of my favorite months of the year, fishing is great inshore and offshore. Weather is beautiful and boat traffic light, a great time to be on the water. 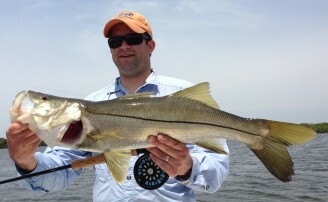 Flats’ fishing is great for Snook and Redfish. Many times the two species are schooled together, action is fast, and often the Trout will be mixed in with them as well. Sometimes we find large schools of Pompano as well on the shallow grass flats, a great fly target. The offshore fishing easily rivals the inshore. The Kingfish are moving in, Spanish mackerel are mixed in with them as well as Little Tunny. The Grouper are moving in closer, lots of Snapper with them as well. Permit can still be found on the reefs. Plenty of Sharks can be caught in the Bay and offshore. Tarpon can still be found in a few bay areas and sometimes on the beaches in the bait balls. October reminds me a lot of April with so much good fishing in so many spots it hard to decide which direction to go. November Again this month is very similar to October fishing. We are in that mid 75 degree water temperature. This is a good water temp for nearly all the species we prefer to fish for at this time of year. Snook and Red fishing is good along with Trout. Many times all three can be caught in the same holes along our mangrove shorelines. Nice Pompano can also be found at times along the edge of the grass flats. Offshore fishing is equally as good, great pelagic fishing for Kingfish, Mackerel and Tunny with Sharks mixed in them. The bottom is also very good. The Grouper fishing is really starting to heat up, and you don’t have to go very far to catch them as they flood into Tampa Bay and the near shore reefs. Snapper are also still available. Cobia can be found in the Bay on the flats this month. Tarpon are slowing down in the Bay, but you can still find some occasionally in the bait balls on the beach. November is a really nice month to be on the water, like most of our fall months, the humidity is low, the fishing pressure is light and the fishing is good. I know a lot of outdoorsmen might be spending this time of year in the woods hunting, but don’t forget about Florida fishing in November; it is hard to beat. December Now I know you have heard me say it before another great month to be on the water, but come on let’s face it; we are fishing in Florida out of Tampa Bay. Tampa Bay is probably one of the best fisheries in the world for sheer number and size of fish. So what do you expect from a world class fishery? Basically the way I see it, if you are not catching fish, your guide is not doing his job. I know that’s a bold statement, but let me tell you unless we have some really bad weather, someone is killing the fish somewhere in Tampa Bay. Each and every day it is my job to be one of those guides. Yes, I do have a slow day every now and then, but I like to be able to count them on one hand at the end of the year. Ok, now it is finally time to discuss fishing in December. Snook fishing is generally good this month for me except for in extreme cold conditions, but this time of year when it’s too cold for Snook, it is great for Redfish in the deeper holes close to the flat. We also catch a lot of eating size Sheepshead and Black Drum. Basically inshore if it’s warm Snook and Trout are on the agenda. If it is cold, Redfish, Sheepshead and Black Drum can be great recreation, as well as some Pompano. Now for the offshore, primarily Grouper and Snapper make up the bite. Most of the time the fish are in close; so you can do some inshore and offshore fishing in the same day without wasting lots of time running from place to place. The beach can sometimes be covered up with Blue Fish and Tunny feeding on glass minnows, which can make for some real fast action.